The media launch for the Tyrannosaurus specimen SUE just happened at the Field Museum, and for those of us that weren’t able to attend the launch(which is probably most people), Phil Hore has provided some great looks into the finished(?) exhibit. And… damn. This exhibit is a work of art. I’m not going to touch too much on these details, as I should be going to visit FMNH PR 2081 sometime in the following weeks. But anyway, there’s a series of splendid video screens set up showing Hell Creek as it was in the latest Maastrichtian, a genius light show featuring the specimen itself, and some shadow displays. And even without all the fancy lighting, the mount looks beautiful in the completed exhibit. The space around Sue has changed dramatically in just four months. Photo on the left by author, and photo on the right by Hore. Antarctic Dinosaurs has been open at the Field Museum for some time now, but I’ve only just visited it in the last few weeks. This was absolutely one of the best traveling exhibits I’ve ever seen. Two visits haven’t been nearly enough for me to admire this exhibit in full. It will be at the Field Museum until early January of 2019, so, there’s plenty of time to run on over to Chicago and experience this excellent exhibit. Antarctic Dinosaurs is split into six sections, dubbed: “Arrival to Antarctica”, “The Origin of Antarctica”, “Fossil Hunting in Antarctica”, “A World of Antarctic Dinosaurs”, “A Transformed Antarctica”, and “Lessons from Antarctica”. As many of the section titles indicate, there is a particular focus on the actual work that experts do in the field and in the lab. This type of focus on the people behind the specimens is always a very good addition to any paleontological exhibit, and Antarctic Dinosaurs is to be commended greatly for this. On almost all signage in the exhibit, there’s a clear format, with one side holding the normal text info, but with the other side in almost a comic book format, and many times including appearances by Pete Makovicky and Nate Smith, as seen below. But, without further ado, let’s arrive in Antarctica. A map of Antarctica, Pete Makovicky, Nate Smith, Cryolophosaurus, and an airplane greet visitors at the entrance. Photo by the author. Arrival to Antarctica is mainly about how people have explored Antarctica, and how exploration methods and technologies have changed from the time of Captain Robert Scott’s doomed exploration, to the modern day. Turning to the right of that map of Antarctica, there’s a video projected on the wall, almost as a sort of “orientation” video introducing the Antarctic explorations of Scott to the visitors. Of course, it’s rather useless, since most visitors just walk right past it, especially since there’s no place to sit near the video(visitors love places to sit). Right next to this projection is a small display case, showcasing some of the first fossils collected and recorded from Antarctica. Haploceras, Harnites, and Gryphaea are just some of the inverts featured in this display. Photo by the author. Specimen cards from the Walker Museum accompany each fossil. Photo by the author. This display case is full of fossils collected on the Swedish Antarctic Expedition(1901-1904) by Frank Stokes, an American artist specializing in Arctic/Antarctic art. These include ammonites(Harnites, Olcostephanus, and Haploceras), bivalves(Lucina), and crustaceans(Glyphaea). These fossils were donated to the University of Chicago’s Walker Museum. After several decades, the fossils found their way to the Field Museum. There’s also a vivid description of the expedition, written by Stokes himself, available online to read. To the side of this display, there’s a large timeline of the history of exploration in Antarctica, starting with the earliest explorations of Antarctica, like the Swedish Expedition, and ending with the expeditions of Bill Hammer and Makovicky. The literal centerpiece of this section sits appropriately at the middle, between two huge photo murals of recent FMNH expeditions to Antarctica. Sledges, shoes, and stuff. Photo by the author. This central display moves away from fossils, and deals with equipment and artifacts from Scott’s doomed Terra Nova expedition. The largest object on display is an original sledge from the expedition. These sledges, judging from documents of the expedition, were used to haul pretty much anything that could fit. On the other side of the display, shoes, pants, coats, medals, and even pony snowshoes are displayed. Feet clothes for ponies. Photo by the author. The next display, naturally, is about modern gear used in Antarctic expeditions. This display features most prominently a full set of ECW(Extreme Cold Weather) gear on a mannequin, with each part labeled on a nearby diagram. Every person on an Antarctic exploration in the US Antarctic Program is issued a set of ECW gear. Right next to the ECWs, there’s a simulated plane interior, with a full set of red netted seats. The next display, right next to the exit of the area, goes back to focus on Scott’s expeditions. It showcases 5 fossils collected on the expedition, including the famous Glossopteris fossils that helped inspire Alfred Wegener’s concept of continental drift. All of these fossils are on loan from the Natural History Museum in London. The wood of Glossopteris sp. Photo by the author. The other fossils in this display case include some other plant remains and a piece of carbonized sandstone. All three of these fossils were all found left behind by the dead explorers of Scott’s expedition. They had kept them until death because they were thought to be too valuable to be left behind, even when they weighed the explorers down. The only Scott expedition fossil on display that was brought back by surviving members of the expedition is a carbonized stem. With a yellow ‘portal’, the exhibit moves to the origins of Antarctica. Photo by the author. “Origins of Antarctica” is where the exhibit begins to really get into the paleontology of Antarctica, starting in the Late Permian to Late Triassic. In this section, the lighting takes on a completely different tone, with aurora australis trailing along the walls. The first display standing abruptly at the doorway is a model of Glossopteris indica. Glossopteris, standing in front of a mural, is a striking sight. Besides serving its obvious educational purpose, it also serves an aesthetic purpose, adding a taste of habitat immersion into the exhibit. Right next to Glossopteris sits some more…Glossopteris. This next display case is all about continental drift, showing some of the most influential taxa, comparing the Antarctic examples to their African counterparts. Glossopteris across two continents. Antarctic remains on the right, South African remains on the left. Photo by the author. Antarctic Lystrosaurus on the left, and South African Lystrosaurus on the right. Photo by the author. South African Thrinaxodon on the left, Antarctic Thrinaxodon on the right. Photo by the author. 6 fossils of four organisms are displayed here: Glossopteris browniana(South Africa), Glossopteris sp. (Antarctica), Lystrosaurus maccaigi, and Thrinaxodon liorhinus. The Antarctic fossils are all casts with the exception of Glossopteris sp., on loan from the University of Kansas. The South African fossils are all, as is expected, originals, due to the great South African fossil collections FMNH has. These fossils are accompanied by great artwork(don’t know the artist, help me out). While this display doesn’t convey the idea of continental drift all that well on its lonesome, it’s accompanied by a more interactive display. …use puzzle pieces. Photos by the author. Building on from the previous display, this next one encourages visitors to use the occurrences of various taxa across the world to piece together Pangaea. It also introduces Cynognathus, Procolophon, and Prolacerta as three new animals in the story of continental drift. Lines are drawn connecting the occurrences of each taxon across the Gondwanan continents, which makes it pretty easy for visitors, in the words of the exhibit, to “piece together the world”. On the other side of the room, the exhibit focuses on plants once more. Kykloxylon, Neocalamites, and Dicroidium give a view into the world of Early Triassic Antarctica. Photo by the author. This display, aptly titled “Seeing the Forest for the Trees”, is about how taking these fragments of trees, and reconstructing the environment and climate of Early Triassic Antarctica. This display is clearly not meant to be a very interesting one by itself, as nothing accompanies the fossils other than some informative text on a sign. However, as is the case with the two displays on the other side of the room, a much more interesting display about the Middle Triassic is paired with this one. Modern Antarctica vs. Mid Triassic Antarctica. More different than day and night. Photo by the author. This display on Gordon Valley offers a literal view into the environment of Triassic Antarctica, and a look at the stark contrast between modern and Triassic times. The signage here describes the situation in both areas. While snow and rock is all that covers modern Gordon Valley, lush vegetation and streams abound in the Triassic. And while researchers chip away at rock and excavate fossils, a much more different tetrapod lies on the opposite side. The 2-metre long answer to the identity of the tetrapod is sprawled out in a similar pose, at the center of the exhibit. Antarctosuchus says hi. Photo by the author. Antarctosuchus, part two. Photo by the author. Just behind the sculpture of Antarctosuchus sits Antarctosuchus itself. The partial holotype skull is on loan from AMNH. The type skull by itself is already a striking display, but a more optimal situation would be to have the teeth displayed alongside it. After all, the dental pattern and morphology is one of the main distinctive features of Antarctosuchus. Not much information is given on this Antarctosuchus display, since all the information was squeezed out by the signage near the sculpture. Next to the type specimen of Antarctosuchus sits the type skull of an even larger temnospondyl. The cold roof. Photo by the author. The much larger sterospondyl Kryostega is represented by an ironically smaller fossil. This, like Antarctosuchus, is also a type specimen on loan from AMNH. Accordingly, since Antarctosuchus‘ spotlight is in a different display, the spotlight has moved to Kryostega here, with one of those comic book-like illustrations. In the panels, as Makovicky contemplates Kryostega‘s life behavior, a Kryostega murders a fish, while what seems to be an Antarctosuchus swims in the background, and a dicynodont appears to scream. The most dramatic and action-packed illustration in the exhibit. Other than another projection onto the wall of continental drift(which, again, nobody stopped to look at), that is the last display of this section. Through another yellow portal thing, the exhibit finally moves into what everybody’s been waiting for: dinosaurs. This section, “Fossil Hunting in Antarctica”, is exactly what it sounds like. After the previous section, the exhibit focuses on the actual work of researchers once more. Across from a long seating area(never was there a time when the seats weren’t filled), four simulations of Antarctic strata stand, each symbolizing a step of the fossil excavation process. Each of these walls has a video projected on it showing the respective step, playing in order. (The videos playing are also the only time the walls get bright enough to take a photo.) These four sections are, from the entrance to the exit: Getting to the Site, Spot the Fossils, Get Out the Fossil, and another one that I might’ve forgotten the name of. Each of these walls has signage hidden among them, as well as dinosaur fossil casts(finally, dinosaurs). Naturally, as everybody is sitting across the room, nobody actually goes to look at these(it’s a pain trying to take photos of the casts while trying not to block the sitters). Near the exit, there’s are two displays on preparation tables. One is a touchable original fossil block from Antarctica, once again training visitors to spot fossils in a mound of matrix. The other display is far more interactive. That’s because it’s an air scribe, and air scribes are fun. The constant buzzing sound will remind visitors of a dental appointment-traumatic for some, fun for others. Photo by the author. Grab the air scribe, and it’ll immediately start buzzing away. It’s not much of an educational activity, but it’s enough for me to stand there for five minutes holding the scribe. It was surprising to see that almost nobody actually took notice of this display. My suspicion is that they thought it was just another untouchable model, which some bigger signage might’ve solved. And after this last display, visitors go through a big yellow portal once more. This next section is actually what everybody’s been waiting for. Here’s those dinosaur fossils everybody’s been wanting to see. Photo by the author. “A World of Antarctic Dinosaurs” starts with the star of the show: Cryolophosaurus. A reconstructed skeletal mount stands in the center of this first area, creating a cul-de-sac around which original specimens of Cryolophosaurus are displayed. This skeletal mount is a completely new reconstruction, very different from the Ultimate Dinosaurs reconstruction, which was the latest skeletal mount of Cryolophosaurus until now. The frozen-crested lizard. Photo by the author. Striding across the room, this mount shows off the large size of Cryolophosaurus, and a gracefulness not seen in other, more allosaur-esque reconstructions. This mount is the first skeletal mount that fully embraces the dilophosaur side of Cryolophosaurus, with a dilophosaurid scapula, a premaxillary notch, four fingers, and longer cervicals. A good amount of this mount is also made up of non-inferred material, possibly from the undescribed paratype revealed in the 2017 SVP abstracts. The signage circling this mount also makes a good deal of emphasis on the reconstruction process, showing a rigorous skeletal. The skeleton is labeled according to the years in which each specimen used was discovered, and all missing parts are stated to be inferred from Dilophosaurus. This is the most accurate Cryolophosaurus skeletal mount out there(although the allosaur-esque reconstruction still hasn’t died, as evidenced by that new one Ohio State just unveiled). Onto the bits and pieces all around the mount. The holotype skull of C. ellioti. Photo by the author. The most significant fossil displayed around the mount is, obviously, the original type skull. While an identical cast replica is on display upstairs in Evolving Planet, the different lighting regime, and the upraised Styrofoam block holding it up make a significant difference in the feel of this specimen. First, it feels more like an actual skull now that it’s in a more vertical position, and second, details are much more distinguishable when the display area doesn’t have a lighting color nearly identical to the color of the bone. The type skull is accompanied by a display nearby about the various crests of early theropods(Dracovenator and Sinosaurus get surprising mentions here). An isolated braincase is also on display. Both of these skull fossils are illustrated on a rigorous skeletal of the skull, shown on the signage below. The braincase in particular connects to the next display, of the brain’s features. A rotatable digital model created from a CT scan is also present on a touchscreen. The left femur. Photo by the author. The pubis. Photo by the author. A series of articulated dorsal verts. Photo by the author. There are three other displays of the Cryolophosaurus specimens around the area, each one focusing on a different part of the body. One display is all about the limbs, another about the pubis, and one about the verts. The left femur is one of the most significant finds, considering how complete and well-preserved it is, as well as being the first bone found. The pubis, on the other hand, is also remarkably complete, and is used by the exhibit to show the basal status of Cryolophosaurus. The vertebrae are used to show a variety of topics, including phylogeny and growth. The single cervical vert is used by a nearby display on pleurocoels, as a touchable cast. Moving away from the fossils, the exhibit once again delves into the world of habitat immersion. The habitat immersion here becomes pretty good, and the models have pretty good accuracy. The Cryolophosaurus doesn’t have broken wrists, it has filaments, and the proportions are all accurate. However, it also lacks lips, which isn’t a huge issue, but it still takes down the accuracy a bit. And even then, a lipless Cryolophosaurus is still acceptable, even if it’s not what’s most preferred. The visible antorbital fenestra might be indicative of shrinkwrapping, although I’m not 100% sure on that. However, even with a pretty accurate model, it just doesn’t feel all that appealing as a model. It doesn’t feel like it could pose as a living animal. Or maybe I’m just seeing things. It’s all subjective, after all. Near the foot of the Cryolophosaurus, there are some teeth in a glass case. Isolated teeth referred to Cryolophosaurus ellioti. Photo by the author. These isolated teeth are claimed to be those of juvenile Cryolophosaurus by the exhibit, and according to the signage, this isn’t a dubious referral. Besides the matching morphology, the microscopic structure also matches that of the older Cryolophosaurus. These shed teeth were discovered at the same place as the Cryolophosaurus type, indicating that the owner of the teeth was feeding on it. In the mural behind, a homage to these teeth is shown in the form of a juvenile Cryolophosaurus scavenging on an an adult’s carcass. On the other side of the habitat hall, a group of sauropodomorphs browse. Lighting and habitat immersion create an environment completely different from the striding Cryolophosaurus just on the other side. Photo by the author. This exhibit here introduces an (as of yet) undescribed sauropodomorph(referred to as “Sauropodomorph A”) to visitors. Three models in different poses accompany a mural illustrating a large herd of these small sauropodomorphs. I’m sure that these models are incredibly accurate, and, subjectively, they look much more like living animals than the Cryolophosaurus. This sauropodomorph, nicknamed the “Jolly Roger”, was discovered in 2010 by its namesake, Roger Smith, and is one of the two undescribed sauropodomorphs on display in “Antarctic Dinosaurs”. As for the signage, kudos to the exhibit for not using the term “prosauropod”. Like Cryolophosaurus on the other side of the room, another small display case sits near these sauropodomorphs. An indeterminate dimorphodontid humerus(on the left) and a tritylodont tooth(on the right). Photo by the author. This small display goes into the non-dinosaurs of the Hanson Formation. One of them is an isolated humerus of a pterosaur(most likely something akin to Dimorphodon) and the other is an isolated tritylodont synapsid molar. These are the only fossils of a pterosaur or synapsid discovered from the formation, accompanied by some…slightly less optimal artwork. Meanwhile, the display of sauropodomorph models serves as a prelude to the next display. Sauropodomorph A, in the bone. Photo by the author. This display focuses on the fossil remains of the “Jolly Roger”, including a 3D printed skeletal reconstruction. It actually progresses in the stages of making the skeleton. Even in the immersion part of the exhibit, it still manages to emphasize the work behind the exhibit. There are three stages focused on in this display, going from the actual fossils themselves to the full skeletal mount. The first stage consists of a display case housing numerous blocks of sauropodomorph A remains, including a beautiful skull. The skull of Sauropodomorph A. Photo by the author. Along with an amazing skull, several other elements of the “Jolly Roger” are on display. One particularly large block includes limbs, ribs, dorsal vertebrae, and caudal vertebrae. A rigorous skeletal also accompanies the fossils, along with the statement that the “Jolly Roger” is in fact most closely related to the South African Ignavusaurus. The next stage, like the Cryolophosaurus display from before, is also about the digital stage. It involves a touchscreen with a rotatable digital model(created with a CT scan) of one large block. However, this time, visitors are able to distinguish the various skeletal elements encased in the block. And lastly, there’s the skeletal mount. The 3-D printed skeletal mount of the “Jolly Roger”. Photo by the author. As the sauropodomorph is undescribed, there’s no way to actually determine if the proportions are correct. The mount also has gastralia, which is a plus. When looking at the skeleton, this sauropodomorph actually has rather weird proportions. The tail looks a bit shorter than one would expect, and the legs are also especially short(then again, according to the exhibit, this thing would have been occasionally quadrupedal). The signage here mainly dumps a huge amount of information about digital modeling into visitors’ brains. The next display focuses on sauropodomorphs once more, including a much more massive massospondylid. A small sauropodomorph, and a bigger sauropodmorph. Photo by the author. A second undescribed sauropodomorph is introduced here(the green one in the photo above), referred to as Sauropodomorph B. This sauropodomorph also has a nickname: “Spence”. “Spence” is slightly longer than the “Jolly Roger”, although both are roughly the same height. Sauropodomorph B is actually most closely related to Leonerasaurus, hence its stockiness compared to Sauropodomorph A. Sauropodomorph B is much less complete, consisting only of the area around the hips, which are displayed in a nearby display case. All of Sauropodomorph B. Photo by the author. The signage here states that Sauropodomorph B is clearly a new species, due to these hips, verts, and limbs parts having especially distinctive features. Another question that’s also touched on is whether or not “Spence” is actually just a young Glacialisaurus. It’s refuted, noting that the bones are fused, showing the animal was fully grown. Some may wonder why that question is touched on randomly, but it makes sense in the museum context. I still remember the Tyrannosaurs: Meet the Family exhibit just a couple months ago, where everybody thought Dilong paradoxus was a baby Tyrannosaurus. Obviously, by now you’ve noticed the huge brown sauropodomorph right next to the green plaque mount of Sauropodomorph B. The legs of Glacialisaurus. Photo by the author. On the plaque mount, casts of the limb bones of Glacialisaurus are mounted in their life positions, as the near 2-D sculpture towers over Sauropodomorph B. The holotype specimen of Glacialisaurus is displayed in the same nearby case as Sauropodomorph B’s only remains, including the relatively famous type foot. A partial femur, tibia, and shin bone are also on display. As with Sauropodomorphs A and B, the closest relative of Glacialisaurus, Lufengosaurus, is also shown. This is the last big display of non-avian dinosaurs. The end to this section is a display about the day and night of Antarctica. A rather normal sunlight-earth model shows the reason behind Antarctica’s darkness. Photo by the author. This display, a rather small stand with a rotatable sun-earth model, uses Earth’s tilt to illustrate the extreme light patterns of Antarctica, both in the Early Jurassic, and all the way to now. Fittingly, this display is also in a rather dark area. As it turns out, this looks rather like an arcade game for kids, so it’s hard to even take a photo when they crowd around this thing. And with that, the Early Jurassic is done. Through a yellow portal once again, the Cretaceous begins. Small fragments represent the dinosaurs of Cretaceous Antarctica. Photo by the author. “A Transformed Antarctica” has a humble start, with just a small display of Cretaceous dinosaurs. Even here, they still manage to give a good amount of information on the work behind the scenes. This display is mainly about how researchers take small indeterminate specimens and are able to determine the group it belongs to. There’s a hadrosaur tooth, a titanosaur caudal, and a foot from a small coelurosaur. For each specimen, distinguishing features are noted in the form of another comic book-like conversation between Makovicky and Eric Gorscak. After this display, the exhibit focuses on the environment once more, in the form of one more projection on the wall of the chilling of Antarctica’s environment. Once again, pretty much nobody stops to watch. Right next to the projection, the exhibit dives into the Cretaceous seas. A modest-looking case of fish, ammonites, and shells serves as an insight into the smaller fauna of marine Cretaceous Antarctica. Not much especially interesting specimens are on display, but this, in fact, is only a set-up for the star of the section. Taniwhasaurus-the last mount of the exhibit. Photo of the author. A cast of Taniwhasaurus antarcticus swims across the section, almost looking as if it was lunging at prey. This particular cast is based off of the 23 foot long specimen IAA 2000-JR-FSM-1 at the Argentine Antarctic Institute. This certainly isn’t the largest mosasaur out there, but in a small space such as this one, it makes an imposing sight. (Confusingly, on the prospectus for the exhibit, this display was symbolized by a Rhomaleosaurus skeleton.) The skeleton is almost perfectly posed with the mural behind it, and the dynamic pose makes it feel like this could actually be a real animal swimming through the sea. This is the last of the Mesozoic displays. Or maybe not…Photo by the author. Putting aside the headless brontosaur figure that a kid must have placed on the next display(I’m questioning the kid’s sanity since the head is gone), this next display moves on to the Cenozoic, around the late Eocene. This is the time when Antarctica began to freeze. Fish teeth and spines added with a certain flightless bird are displayed here. Photo by the author. A vision of life in Antarctica before the freeze is given in the form of six fish fossils, including the spine of a chimaera, and a cow shark tooth. These fossils were all collected on Seymour Island, and all have been dated to the Late Eocene. A great diversity of fish are shown here, but the only non-fish here is a sign of the impending disappearance of organisms. A single penguin tarsometatarsus is a sign of the changing fauna once Antarctica freezes over. This specimen, on loan from the Jackson School Museum of Earth History, shows the stubbiness of the bone that makes penguins have their waddle. Oh, right, there’s also an emperor penguin standing nearby. The last dinosaur in the exhibit. Photo by the author. From this point, the exhibit no longer has a strict focus on prehistory. The next, and last section focuses on the present and the future. What Antarctica holds for science. Photo by the author. “Lessons from Antarctica” focuses on how researchers of all specialties and all nationalities can go to Antarctica to better understand the continent. It’s split into five small displays: meteorites, fossil pollen, an ice core, ice shelves, and lichens. In the meteorite section, a fragment of pallasite(a rare type of stone meteorites) found in 1961 is on display. In the fossil pollen section, it’s exactly what you would expect: fossil pollen. But the ice core is an especially interesting display. A replica of an ice core. Photo by the author. Ice cores are simply large samples from big ice sheets that give a look into the history of the sheet, and how the environment around it has changed over time. The ice core on display in “Antarctic Dinosaurs” is only a replica, but has those distinctive bands acting as symbols of environmental changes. The next display, about glaciers and ice shelves, is just a large sign, without any actual display items. And the last display, about lichens, includes lichens using black discs as sunblock, and a lichen growing on substrates. All of these small displays circle around a single projection in the middle of the room. In the very center, a constant projection of a map of Antarctica glows. This is a symbol of all the nationalities present in Antarctica, doing research. It’s very much a symbol for the future of Antarctic science. Antarctica is a continent for the entire world. That’s the closing message of “Antarctic Dinosaurs”. This is a big time for the Field Museum. The museum is celebrating its 125th anniversary. Máximo the Patagotitan has taken center stage in Stanley Field Hall, accompanied by Quetzalcoatlus, Pteranodon, and Rhamphorhynchus. Antarctic Dinosaurs, one of the best special exhibits I have ever seen, has opened(be on the lookout for another blog post on the exhibit in the near future). Sue has been remounted, and is getting an entirely new exhibit built for her. And the entrance to Evolving Planet has also been remade. And yet, during my first visit to FMNH this year, only one of those things was an objective of my visit. That’s because I was actually there to visit Christopher McGarrity and Adrienne Stroup, who both showed me around the geology collections. But since collections aren’t too much of our focus here, I’ll just show some of the highlights. The arm of Stylinodon. Photo by the author. The first specimen I saw was the arm of Stylinodon, lying out on a table. I was actually told that some decades ago, a cast of the arm was desired to be a backscratcher, which would have been rather effective. On my second visit to FMNH, which was less than a week from the first, this specimen was on display in the Grainger Science Hub, where specimens from the Collections are temporarily exhibited. Tooth plates of the Edaphosaurus novomexicanus type specimen. Photo by the author. A baby mastodon skull collected by Bill Simpson in Monroe County. Photo by the author. The type skull of Thylacosmilus. Photo by the author. The lower jaw of the type of Thylacosmilus, with a foam curvy structure. Photo by the author. The left sabertooth of the Thylacosmilus holotype. Photo by the author. One of the most notable specimens in the mammal collections is the holotype skull of Thylacosmilus. This, along with the Stylinodon arm, was also displayed in the Grainger Science Hub during my second visit. The left saber in the skull of Thylacosmilus is actually a replica, since the left saber hadn’t been discovered when the majority of the skull was unearthed. But in a stroke of luck, the Captain Marshall Field Expeditions actually discovered the left saber belonging to that specimen, down a hill. Right above the Thylacosmilus, another very important mammal was hiding in a shelf. The tiny holotype skull of Morganucodon oehleri. Photo by the author. This specimen of Morganucodon is officially “on loan” from the Catholic University of Peking. Since CUP doesn’t really exist anymore, it’s now “permanently on loan”. The type of Morganucodon oehleri is part of a cache of fossils actually smuggled out from the Catholic University of Peking. H.W. Rigney, the describer of M. oehleri, dispatched an envoy in 1948 to Lufeng, forming a huge collection of fossils. However, this collection was smuggled out of China, distributed to foreign scholars, and now resides at FMNH. Next, dinosaurs. Specifically, dinosaurs in the mammal collections. A ton of Cryolophosaurus bones. Photo by the author. The day I visited, there was a plethora of Cryolophosaurus verts and ribs lying out in the mammal collections. 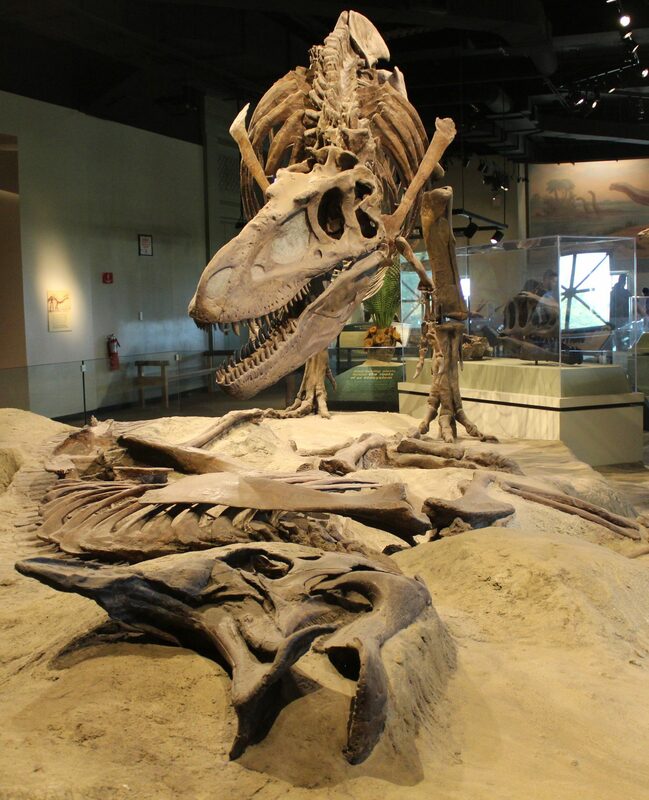 They all had that very distinct color that comes from Hanson Formation fossils, and were lying along side some other Hanson fossils, including a fibula from the undescribed sauropodomorph, one of the Jolly Rogers. But besides these Antarctic fossils, there were no other dinosaur fossils in the mammal collections, logically. The dinosaur collections are underground, in the Collections Resource Center. And as you would expect, it is full of holotypes. Scapula from Camarasaurus, with a headless mosasaur skeleton in the background. Photo by the author. The holotype of Siats, with the description. Photo by the author. The holotype of Siats, while far from eye-candy, still manages to impress, simply because of how large some of the bones are. The caudal dorsal centrum of Siats. Photo by the author. The cranial dorsal vert of Siats. Photo by the author. The size of some of the verts is almost shocking. Siats‘ reputation as a huge megaraptoran superpredator is well-earned. But there’s a far larger apex in the dinosaur collections. A fused caudal vert from FMNH PR 2081. Photo by the author. There are quite a few pieces of Sue around collections. The caudal vert above is one of them. The reason it’s not on the mount is because of the fact that it’s a fused bone, and to mount it, FMNH would have to go full-on 20th century style, and drill through the bone. So, a cast is on the mount instead. There’s also a much smaller tyrannosaur in Collections, of which has much more in Collections than Sue. The beautifully preserved foot of “Elmer”, a juvenile Gorgosaurus. Photo by the author. The pubis of “Elmer”. Photo by the author. The tail of “Elmer”. Photo by the author. “Elmer”, a juvenile Gorgosaurus that Elmer Riggs had discovered, also resides in Collections. Temporarily on display last year in the Field Museum’s Specimens exhibit, this is a magnificent specimen, especially with that excellently-preserved foot. But so far, I’ve only shown you the smaller bones. There are far bigger fossils here. The holotype femur of Brachiosaurus. Photo by the author. Holotype verts of Brachiosaurus. Photo by the author. Behind Sue, the Field Museum’s most famous specimen may just be the holotype of Brachiosaurus. While only the humerus and multiple other verts are on display in Evolving Planet, much more of the holotype is here on this shelf. The femur actually looks a bit like a toy car with those wheels strapped to the wooden planks holding the bone and plaster jacket up, which I guess is conventional for moving the huge bone around. Oh, Antarctosaurus is also here, I guess. Photo by the author. The holotype skull of Thalattoarchon. Photo by the author. Postcranial elements of the Thalattoarchon holotype. Photo by the author. Thalattoarchon is an interesting ichthyosaur, but the holotype isn’t great. It took longer than I would like to admit for me to realize that the skull is the skull, since it’s divided into three pieces by foam slips. However, there’s a ton of info piled around the holotype for some reason, making quite a big deal out of it. However, there’s an ichthyosaur specimen in FMNH that I was much more interested in. Cymbospondylus disapproves. Photo by the author. The Cymbospondylus skull is, by far, the most fun ichthyosaur specimen in there. That’s simply because it’s either really concerned, or angrily disapproving of something. Obviously, it wouldn’t have that angry looking brow in real life, but taphonomy can be amazing sometimes. Slightly farther away, under a shelf, it’s the basal pareiasaur, Bradysaurus. The partial skeleton of Bradysaurus baini. Photo by the author. Not much comments here, other than the fact that the legs that aren’t under the shelf are the hindlimbs, not the forelimbs. So, if it looks headless, it’s actually tailless. The skull and limbs of that mosasaur seen above behind the camarasaur scapulae. Photo by the author. The holotype skull of Parasaurolophus cyrtocristatus. Photo by the author. FMNH is home to the holotype of Parasaurolophus cyrtocristatus. While most of the holotype is mounted in Evolving Planet, the skull remains in Collections, sort-of hidden in the back of a shelf. This makes it so that the only really distinguishable parts of the skull are the crest and the back of the skull. Now, there’s only one more type specimen I’m gonna show, and it’s of an avian dinosaur. The holotype of Andalgalornis, with some painful-looking internal armatures. Photo by the author. In the holotype of Andalgalornis, one of the most notable features is not the holotype itself, but the armature in the jaws. They’re internal armatures, meaning they’ve essentially been drilled through, causing permanent damage(although this was the norm in the mid-1900s). Now, that’s all I’m going to cover in Collections. Let’s move on to the fossil hall stuff. After the dinosaur collections, I was led into Sue’s new exhibit, still under construction. How most visitors see Sue nowadays. Photo by the author. While pretty much all visitors are limited to seeing Sue from that tiny little window. I got to go into the little wooden box that they had built around her myself. It was extremely satisfying to walk past that little window as the crowd of people looking at Sue were puzzled by the sudden appearance of some seemingly random visitor. After going past a set of doors in what almost looked like a huge Ziploc bag, I entered Sue’s little wooden box. The view upon entering Sue’s little wooden box. Photo by the author. In this small space, Sue is absolutely massive. And with that dramatic lighting in the wooden box, it creates an incredibly surreal experience upon entering that room. Without all those people crowding around her, and in almost-perfect silence, an imposing presence radiates out from Sue. While it is still clear that this pose is quite similar to the old Sue in Stanley Field Hall, it has a completely different air about it. Maybe it’s the jaws, now open wider. Maybe it’s just the lighting. Maybe it’s the fixed leg. Whatever it is, I have a feeling that this Sue experience is going to be completely different from the one in Stanley Field Hall. FMNH PR 2081. Photo by the author. In her new exhibit, habitat immersion is definitely going to be put in use, fully contextualizing Sue in her 66-million year old environment. This one exhibit will recreate Hell Creek, and in center stage, the most complete Tyrannosaurus specimen ever discovered, FMNH PR 2081. Well, guess it’s time to cover more of “Deep Time”. In this post, mounts shown on the website, video, and on social media will be covered. So, without further ado, let’s dive into the skeletal mounts of NMNH. Naturally, the main attraction of the fossil hall will be the T. rex display. This mount is probably the most publicized display in “Deep Time” out there. It’s a spectacular mount, portraying the Nation’s T. rex(the original specimen of what used to be dubbed “Wankel Rex”) attempting to decapitate a cast of the Smithsonian’s staple Triceratops, “Hatcher”. There is no doubt that this display will be incredibly accurate. Research Casting International is at the top of their field. You can even see a scar of battle on “Hatcher”, on its left horn, where the tip is broken off. From another view, the ribs of Hatcher are slightly cracked from the foot of Tyrannosaurus One great thing about the mount of “Wankel” is that reconstructed portions(excluding the cast skull) are clearly marked out, showing visitors that complete skeletons aren’t as common as older museum exhibits would cause them to believe. For me, this is probably going to be the most spectacular mount of a real Tyrannosaurus specimen in the world. Megaloceros is one of the NMNH’s oldest fossil mounts, having been put on display in the Smithsonian “castle” in 1872. All renditions of the mount so far have been in the standard, regal, pose that almost all Megaloceros mounts are in. Therefore, this sitting pose is a very nice change from orthodox. According to Extinct Monsters, the sitting pose was chosen because those huge antlers will now be brought down to near-eye level. This will probably offer a completely different perspective on the antlers of Megaloceros, and emphasize the extravagance and huge size of them. Next, one of my favorite mounts of Deep Time. The Smithsonian’s new Smilodon mount has got to be one of the most dynamic and unique mammal mounts in the hall. Looking at concept art, it’s going to be in its own little glass display, and it’s going to be essentially lunging towards the visitor. The pose is also not just good for aesthetics, but also good for showing off those huge teeth better, since they’ll be much closer to the visitors. It almost feels like an accented version of the old mount of Smilodon, in which it was in a pose very much like this, but with a more upraised body, in a confrontation with a Paramylodon(which will not be returning). The dismantling of the Smithsonian’s Diplodocus in 2014 marked the first time the entire mount was moved in 83 years. As of July 31st, the Diplodocus is under construction, with its head craning out(presumably hanging above the visitors), once again in normal diplodocid horizontal fashion(because Taylor et al. 2009 doesn’t exist). It really does look like a pretty normal Diplodocus mount, which is a bit disappointing, considering that so much other new mounts in Deep Time have dynamic poses. Oh, and there’s the little nitpick of not being able to take good photos of the entire mount without that giant cardboard-looking conifer in the way. In the background of the photo, you can see two displays completed already: the mastodon and the Xiphactinus. And so, let’s transition into those two displays a bit. Unlike it seems in the first photo, the mastodon will not be displayed alone. Two (presumably human) hunters will be tossing spears at the giant proboscidean. A human hunting scene like this is a very nice addition to Deep Time, emphasizing one main topic of the exhibit: the impact of humans on this planet. That impact is very much reflected in this display. This new mount will be much more dynamic than the rather plain standing pose it’s assumed in previous incarnations of the fossil hall. Now, moving on to the fish. The pose of the Xiphactinus in Deep Time is identical to its pose in the pre-2014 fossil halls for obvious reasons. This specimen has technically been off-display for much longer than other returning specimens, due to the August 2011 earthquake that closed the upper mezzanine, where Xiphactinus was displayed. In the new hall, it will be brought down much closer to ground level, displayed next to what presumably is Tylosaurus. In Ed Yong’s article for The Atlantic, which the photo of the Diplodocus is from, it’s also stated that the Eremotherium, the Smithsonian’s resident giant ground sloth, is also completed. Anyway, moving on to the NMNH’s other sauropod, Camarasaurus. The new pose of the NMNH Camarasaurus is very unique and very dynamic. And it’s a huge improvement of the roadkill-type display it was in during the age of the pre-2014 fossil halls. This pose comes at a surprise, due to the Camarasaurus not being seen rearing up in the concept art of Deep Time. But it’s a very welcome surprise, because this will very much emphasize the size of Camarasaurus, in much contrast to the old display. But…that tree is just…really poorly done. It doesn’t even seem like they’re trying to do any convincing habitat immersion. And so, we are done. Much new details on mounts are expected to trickle through in the next year, so be on the lookout for that. Well, if this doesn’t kill the old unicorn Tsintaosaurus from public knowledge, Jurassic World Evolution will (not sponsored). From the Twitter of Teresa White, the first(probably) non-unicorn Tsintaosaurus mount is going on display at Dinosaurs Unearthed: Down to the Bone at the Telus World of Science in Edmonton. Peter Makovicky has posted the newest photo of Sue on Twitter. But it’s not just one photo. …after this concept(albeit a probably inaccurate one) was released, maybe I just expected something more different from the original mount. You have a closed mouth and a more regal, upright pose for the neck in the concept art, and then you have an open mouth(hopefully not roaring) and a more horizontal neck for the actual mount. However, without context of that concept art, this mount is great. They’ve opened up Sue’s jaws, and the sheer size of Sue will be, without a doubt, emphasized in this new space. The mount is very imposing, and, even though the Sue exhibit will only be opening in 2019, the fast completion of the mount is still great. This is because of that peephole into the exhibit near the display on cetaceans. All the kids can now see Sue once more, and all those people who were complaining about not being able to see Sue until 2019 can now be satisfied. Let us welcome the newest addition to the plethora of Tyrannosaurus mounts, the new FMNH PR 2081.